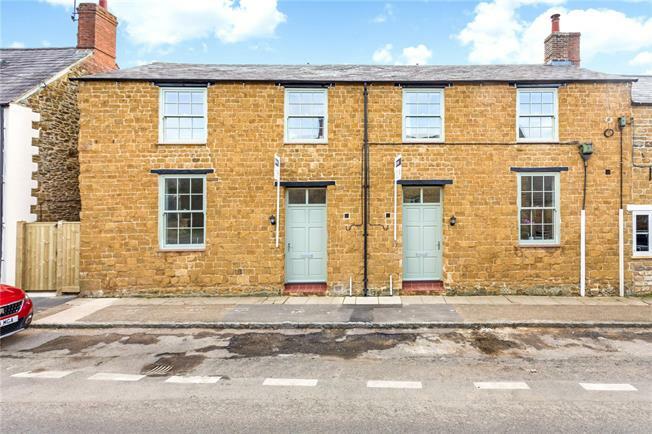 3 Bedroom Semi Detached House For Sale in Banbury for Guide Price £475,000. The accommodation in more detail comprises an entrance hall with storage cupboard and stairs rising to the first floor, cloakroom which is fitted with a white suite of pedestal wash basin, mixer taps and wc. Glazed double doors from the entrance hall lead through to the excellent open plan kitchen/dining/living space which has a light and airy feel to it due to the large windows and high ceilings. The superb kitchen area is fitted with an attractive range of cupboards and drawers beneath Granite worktops, matching up stands, under mounted sink with mixer taps over. Built in washing machine, dishwasher and twin bins. There is an Island unit providing additional cupboards with chunky oak worktop. Space and plumbing for an American style fridge/freezer. Rangemaster stove with induction hob and multiple ovens. The rest of the living space is open plan with a fireplace which offers the opportunity to install a wood burning stove and a French door opening onto the rear courtyard. On the first floor there are three bedrooms, the master bedroom with, exposed A frame timbers and an ensuite of large tiled shower with glass screen, pedestal wash basin with mixer taps, wc and a heated towel rail. The family bathroom consists of a bath with glazed screen and shower over, pedestal wash basin with mixer taps, wc and heated towel rail. Agents Note, the neighbouring property has gated rear access for fire escape only.